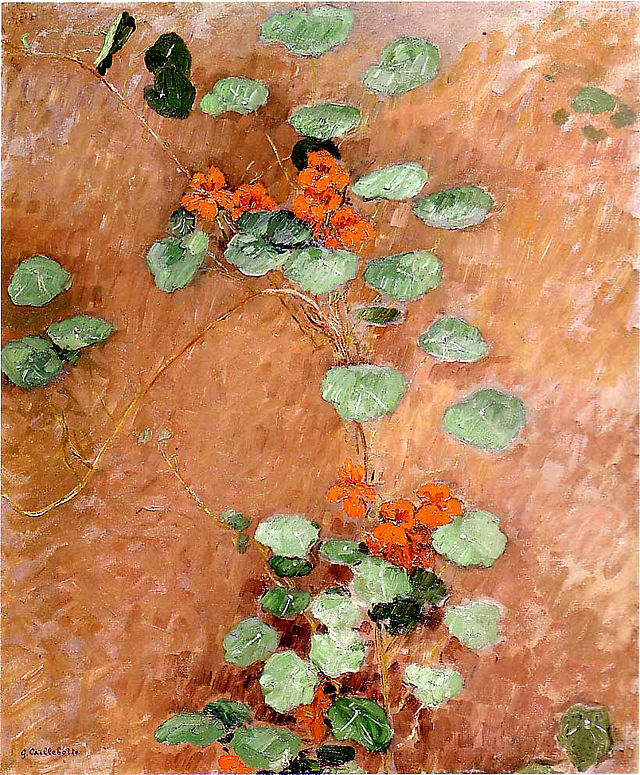 Caillebotte's reputation as a painter was negligible until the 1950s when his descendents began to sell the family collection and art historians began to evaluate or reevaluate his paintings. His striking use of perspective and the balance he achieved between realism and impressionism engages the viewer. 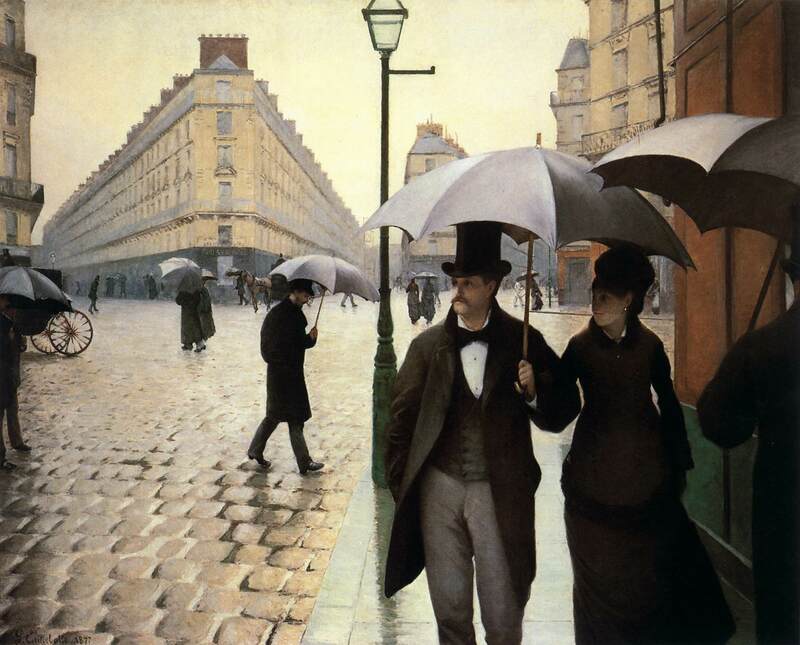 In 1964 The Art Institute of Chicago acquired Paris Street; Rainy Day, spurring American interest in the artist. By the 1970s, his works were being exhibited in a number of venues. Years ago during a trip to Chicago, this was the first Caillebotte painting I encountered. The large canvas (83.5 by 108.7 in) makes it difficult to ignore, but the two point perspective and the artist's obvious influence from photography draws the viewer into the vivid painting. Even years after seeing this work I could pull it up in detail in my mind's eye. 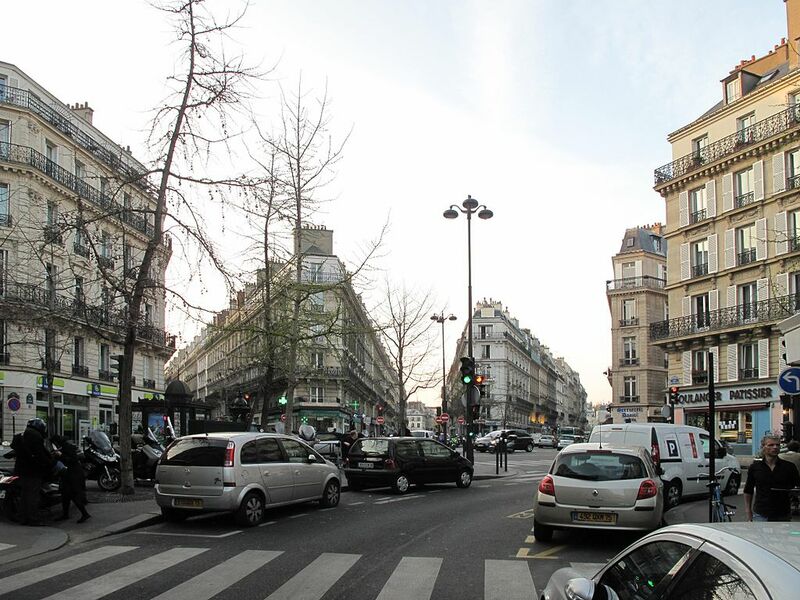 Place de Dublin depuis la rue de Moscou has not been improved by the addition of cars. 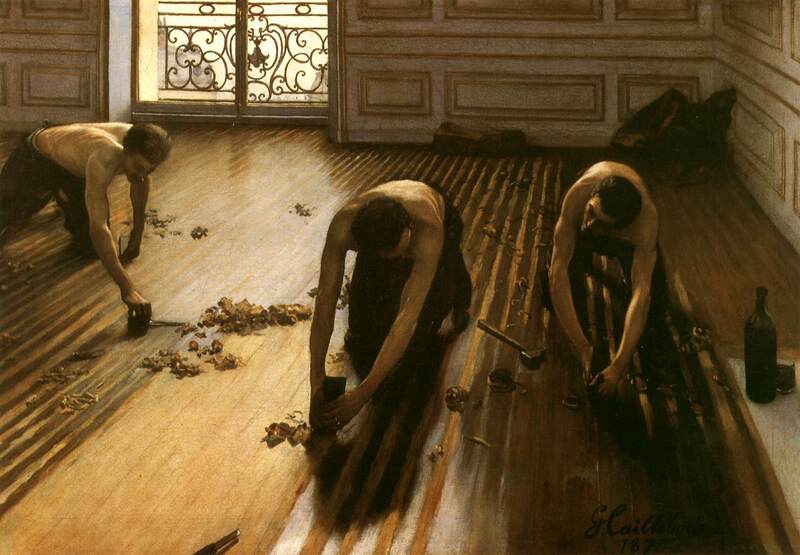 Some years later on a visit to the Musée d'Orsay, I encountered The Floor Scrapers and my admiration for Caillebotte became permanent. The painting was originally rejected by the Salon in 1875. The subject matter was too strong for the sensibilities of art critics 1875; even today it gives a tiny shock to the viewer (even for those who witness beheadings on the nightly news). The Salon recanted in 1876 and the painting was exhibited, along with several other of his works. I was involved in a project at the Nelson-Atkins in Kansas City when they purchased the Caillebotte, Portrait of Richard Gallo. Although I admired the painting at the time I was unsure what to make of it. The sofa seems to be alive with shapes and colors, like a medieval manuscript and the figure floats rather than sits on the sofa. The room appears to be the same as the one in Les raboteurs de parquet. Some time after my initial exposure to the work I connected it with a painting by a friend of Caillebotte's, Cezanne. The connection seems obvious, but the dates do not correspond. The Kimbell in Fort Worth has a small collection, but most works are real jewels; including the Museum itself, the work of architect Louis I. Kahn, and recognized as one of the most significant works of architecture of recent times. I was stopped in my tracks by On the Pont de l'Europe. The painting is almost monochromatic and blue tones correspond to the winter cold. The principal figure, with his collar turned up against the cold, and the figure on the left, are dressed in identical fashion. The two figures reflect man facing a new society with its mass-produced prefabricated parapets, girders, and rivets, which not only block their view but become the view. The figure in the bowler hat can at least see past the girders. 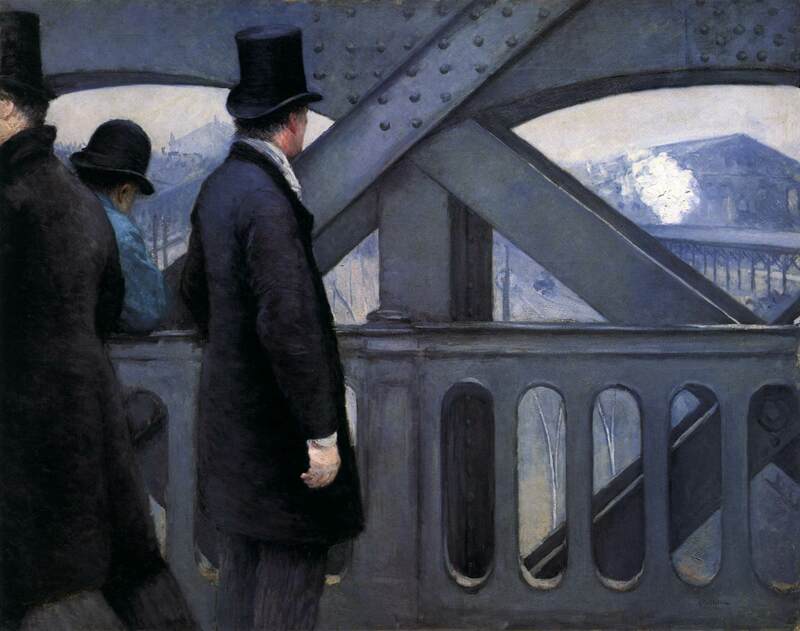 For this composition, Caillebotte adopted the geometric structure of the bridge, one pier of which bisects his picture vertically into two arched bays, these each subdivided by diagonal cross-bracing struts. The humanity of the figures resides in their freedom to stand apart from the rigid symmetry. The Pont de l'Europe overlooks the Saint-Lazare train station, which was famously portrayed by Monet in a dozen paintings (see following page). Caillebotte purchased three of Monet's variations on the station theme and refrained from showing his on the Pont de l'Europe. at the same exhibition - perhaps not to compete with his friend. As well as being a painter, Caillebotte was the most important early patron of the Impressionists. They invited him to be in their second group exhibition in 1876, and later that year he wrote a will promising his collection of works by the artists to the French state. His collection of paintings included works by Pissarro (68), Monet (14), Renoir (10), Sisley (9), Degas (7), and Manet (4). 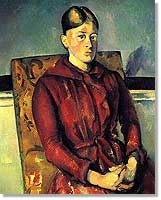 Upon his death however, the French government refused many of the paintings, labeling them "drifts of unhealthy art". Only 40 of the paintings were accepted. In 1928 the government requested the remaining paintings, but the bequest was repudiated by his family. The family sold many of the remaining paintings to Albert Barnes and those painting are now in the Barnes Foundation in Philadelphia. The paintings that were accepted by the French government form the nucleus of the collection at the Musée d'Orsay. 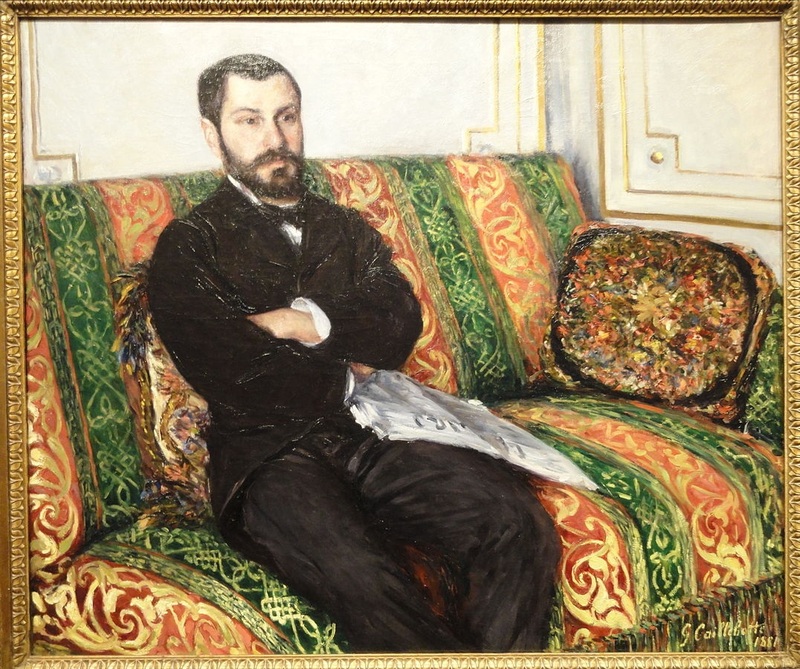 It must be remembered, that Caillebotte was a man of many interests. He trained as a lawyer as well as an engineer. He seemed to be in a state of perpetual experimentation. For example, he was passionate about horticulture. He raised hot-house orchids and planted gardens. He was an excellent builder of yachts, and loved to race them. He organized and financed regattas and rewrote rule books. He designed his own boats, ones of modern sleekness that earned him national fame. He was absorbed by stamp collecting (his collection is now in the British Museum) and dabbled considerably in textile design. As a painter he is difficult to categorize. From admired painters he borrowed colors and moves and fit them to his peculiar perspectives. Caillebotte eventually backed off from the Impressionists as a group. He was distressed by the infighting and had had a spat with Degas. In 1883 he painted only two pictures. He seems to have enough of Paris and spent much of his time at an estate he had bought in the village of Petit Gennevilliers a few miles away from Paris, where he developed enthusiasms that overshadowed those for art. However, between 1886 and 1894 he painted 43 canvases, most done in the Impressionist style. Though never married, Cailebotte had a relationship with Charlotte Berthier, to whom he left a sizable annuity. 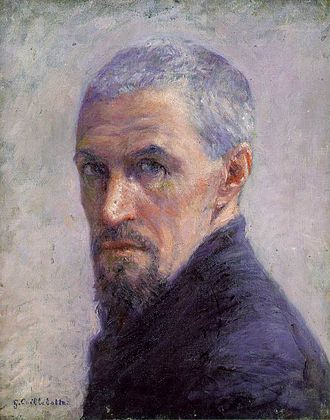 Caillebotte died of pulmonary congestion while working in his garden at Petit-Gennevilliers in 1894 at age 45, and was buried at Pere Lachaise Cemetery in Paris. In the painting below, completed two years before he died, Caillebotte seems to have become much freer in his art and more of an impressionistic artist. Link to additional paintings by Caillebotte.